WiFi Toilets? - The Internet Of Things. It's TRULY, the next BIG thing. 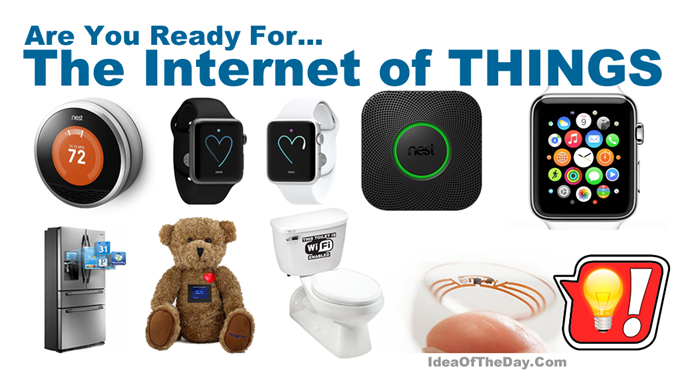 The Internet Of Things is Coming... are you ready? Another big revolution in technology is just taking shape. To say this is the next BIG thing is an understatement. Today's technology is just building blocks for things to come. It's that BIG. Take a dozen ordinary objects in your room, then imagine what they would be like if they were somehow connected to the Internet. That's the Internet of Things. Why the heck should all my stuff be on the Interwebs? Good question. My answer... WHY NOT? The longer answer... because it takes good things, and makes them great.